Hell Fest is a traveling horror night that rolls into town and a group of friends get VIP passes to go and enjoy the spooks. Think of it as a haunted house that covers an entire theme park. Little do they know that hidden among the park employees is a masked killer that picks off visitors that aren’t scared. Hell Fest is Directed by Gregory Plotkin, and I feel he took a huge Plotkin on the slasher genre. Plotkin has spent most of his career as an editor, most notably Second assistant editor on Weekend at Bernies 2, as well as Get Out, and Paranormal Activities 2-5. His only other feature length film directing credit is Paranormal Activity: The Ghost Dimension. It stars Amy Forsyth as Natalie, the protagonist returning home from school to visit her grade school BFF Brooke played by the distractingly beautiful Reign Edwards. Along for the ride and generally being an annoying presence is Taylor played by Bex Taylor-Klaus. Each one has an arbitrary boyfriend to accompany them to the park that might as well be nameless for all the character development that they get. Hell Fest can be found in theaters now. The film suffers from terrible dialogue and annoyingly vapid characters. The cast overacts like they are in a Disney channel show, to the point where I actually welcomed their deaths. The setups for the murders are unbelievable even for horror standards, and waste opportunities to take advantage of the unique premise. There are a few good death scenes, but on the whole it falls flat. I originally gave it a 3, but because it had a head explosion, it gets an extra point. My main gripe with Hell Fest is that there is an inherent flaw in some of the death scenes. The park is stuffed to the gills with visitors and employees. The characters even need a VIP pass to skip the massive lines. Even with the VIP pass, there are lines. EXCEPT when the killer is chasing them! At one point they are running away from the killer, but get distracted by the spoopy scares from the maze. They take a leisurely 10 seconds to pause and look at the room. There is no animatronic that can compete with the actual possibility of murder. Even when they get to a room with a bunch of reaching out hands, they freak out instead of, you know…asking for help from the people attached to those reaching hands. One of the park employees reaches out to help the girls, but it ends up being the killer without the mask. The capper to the movie is a lame and predictable epilogue that for some reason tries for one last scare the second after it undercuts the premise. The killer goes home to a generic suburban home and hangs up his mask before going inside and hugging his daughter. For some reason the director was trying to make it seem like the girl was in danger, but… we are already shown that he lives there. Is Hell Fest Worth Watching? I can’t recommend seeing Hell Fest in theaters, but it might be worth watching at home when it gets to Netflix. Even then, you will probably enjoy making fun of it with friends more than actually watching it for scares. 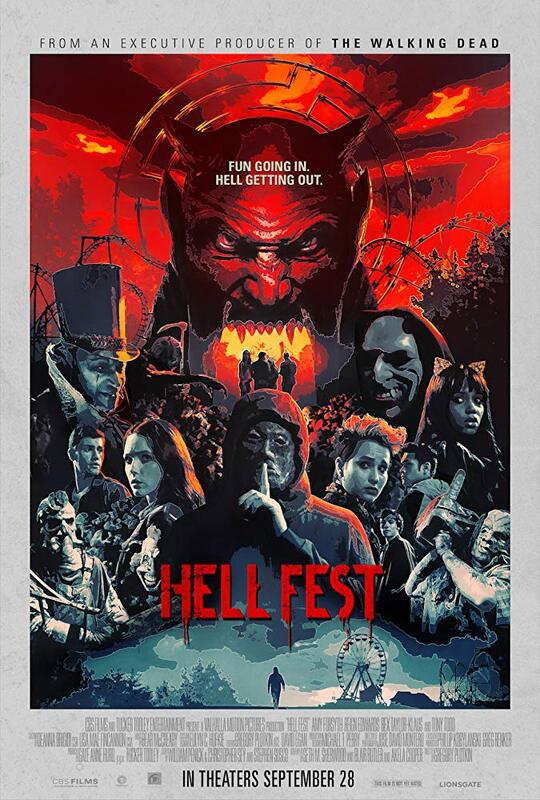 Did you see Hell Fest? What did you think? Have you ever seen a movie that had a distractingly implausible premise for getting trapped by a killer? Leave your comments below. Also, don’t forget to subscribe and review us on Apple Podcasts. It was a great premise, just so many wasted opportunities.